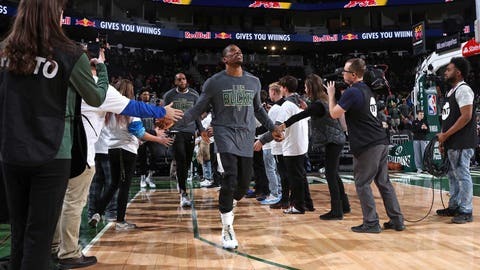 Sunday, March 10: Milwaukee guard Eric Bledsoe gets his named called before the Bucks played San Antonio at the AT&T Center. 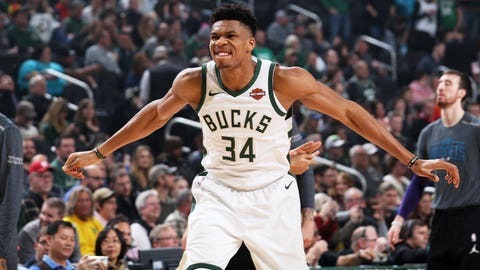 Sunday, March 10: Giannis Antetokounmpo tallied 27 points, 13 rebounds and six assists in the Milwaukee Bucks’ 121-114 loss to San Antonio. 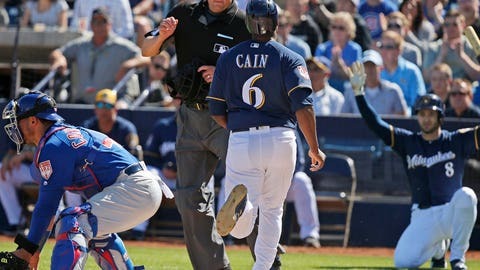 Sunday, March 10: Ryan Braun cheers in the background as Lorenzo Cain crosses home plate in Milwaukee’s 7-5 win over the Chicago Cubs in spring training. 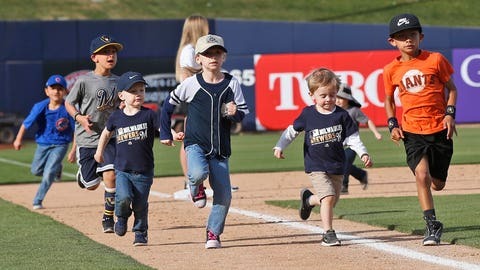 Sunday, March 10: Young Milwaukee Brewers fans round third base and head home while running the bases at the American Family Fields of Phoenix. 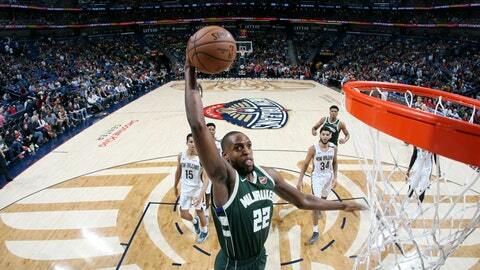 Tuesday, March 12: Bucks' Khris Middleton dunks two of his 23 points against the New Orleans Pelicans. 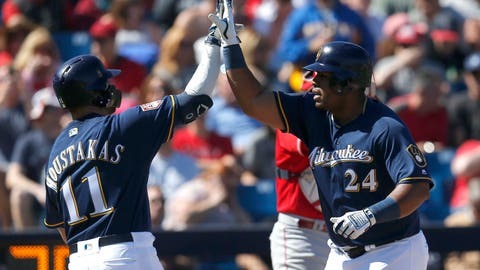 Thursday, March 14: Brewers first baseman Jesus Aguilar celebrates with Mike Moustakas after hitting a home run against the Los Angeles Angels. 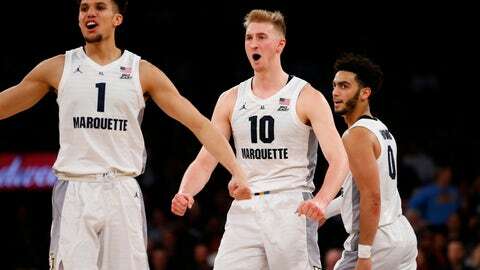 Thursday, March 14: Marquette's Brendan Bailey, Sam Hauser and Markus Howard react after scoring against St. John's in the Big East tournament. 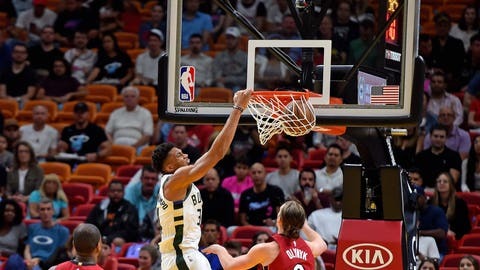 Friday, March 15: Bucks forward Giannis Antetokounmpo dunks the ball past Miami Heat forward Kelly Olynyk. 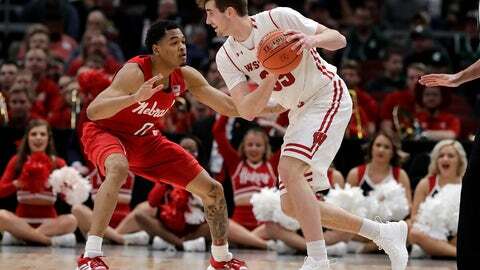 Friday, March 15: Wisconsin's Nathan Reuvers tallied 14 points and six rebounds in the Badgers' win over Nebraska. Saturday, March 16: Ethan Happ logged 20 points and six rebounds in Wisconsin's 67-55 loss to Michigan State in the Big Ten semifinals.